Balagog gro-Nolob is an Orc rogue who keeps a hidden identity as the famous chef called the Gourmet. 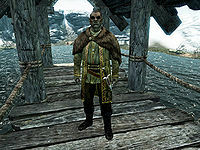 Balagog was trained in Breton cuisine during his time in High Rock, where he befriended Anton Virane, a fellow student. 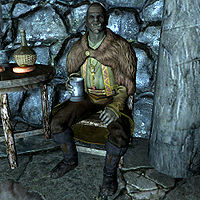 Balagog went on to publish a cookbook called Uncommon Taste under the pseudonym "The Gourmet", which became wildly successful throughout Tamriel and led to his being hired as the emperor's private chef for his visits to Skyrim. Due to this association with the emperor, Balagog is eventually marked for death by the Dark Brotherhood. He wears fine clothes and fine boots. Balagog defends himself with an iron dagger and also carries forty gold, a belted tunic, and boots. Balagog lives in the cellar of the Nightgate Inn, only leaving once a day around noon to fish by the nearby pond. He prefers to interact with other people as little as possible to maintain his secret identity, and is known to most of the Nightgate Inn's regular patrons only as "The Orc". The other patrons pay him little mind, while the innkeeper says that he doesn't care, since Balagog always pays his rent on time. You cannot interact with him until the related Dark Brotherhood quest, in which the only conversation options are to announce to him that his true identity is known or tell him it is time for him to die. If Balagog is approached before starting the related quest, he will politely direct you towards the innkeeper: "I can't help you, friend. Talk to Hadring, the innkeeper." He may also say, "I value my privacy. So if you don't mind?" All further attempts at conversation will be politely dismissed: "I really don't mean to be rude, friend, but I'm not feeling particularly sociable..."
If you ask Hadring if he gets much business, he will mention Balagog: "Course there's the Orc. Long-term tenant, that one. For what he pays, I could afford to shut this place down." Further asking him about the Orc will be replied, "Him? Oh... Ah, name's Balablob or Malaclob, one of them funny Orc names. Talks real good, though. Not a savage at all. Said he's a writer. Don't know what kind of job that is, but it must earn him some pretty coin. He's paid up for the next few months. He mostly just hangs about. Goes down to the lake, sometimes samples the stores of wine in the cellar. Man can do whatever he pleases, far as I care." Alternatively, asking Fultheim about Balagog will have him tell you, "Well he don't like company, I can tell you that much. Just wants to be left alone. But no... that's not really it. It's like... he wants to talk. Likes people and all. But he stays separate, because he's supposed to." and adds, "Kind of sad, really." "You've served your last meal... Gourmet." "Soon, the Emperor will die. Murdered, by the Gourmet." If you've chosen the last option, talking to him again will have him tell you, "Please, just let me be..." Upon killing him, you can now retrieve the Gourmet's writ of passage from Balagog's corpse. He cannot be reanimated, no matter what the spell magnitude. You may encounter Balbus on your travels. He is looking for the Gourmet so he can impress him with his skills. His crime faction is set to The Reach even though he only ever appears in The Pale. This bug is fixed by version 3.0.11 of the Unofficial Skyrim Legendary Edition Patch. This page was last modified on 11 November 2017, at 02:14.